Let us explore the inside of darkness, again encroaching like a thief upon our sun-time. Long completed is October’s riotous show. Leaves from scarlet maples, burgundy pear trees, buttery tulip trees have already gorged November’s appetite. Winds smart our cheeks as we follow paths strewn with detritus of twisted branches, broken stems, graying fragments, acorns, even the first gumballs. Overhead, shrouded pin oaks usher in the waning light, against which skeletal branches frame the darkening world. An eerie stillness companions this loss of color. Solemnity stirs deep thoughts like chanting monks in hushed retreats. We listen, deeply. We seek footholds within the ensuing darkness: its port-wine richness intrigues us; its lavender essence intoxicates us; its velvety embrace soothes us; its subtle shades challenge us; and its haunting music transports us to other realms. An unseen power plummets us within the darkening, replete with life-lessons, if we’ve the will to notice. 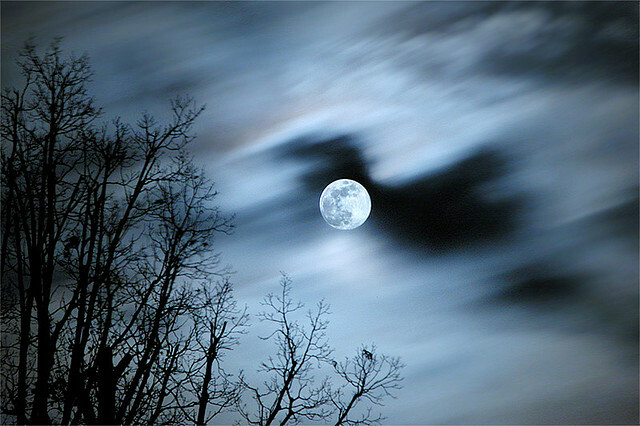 We wait for direction beneath tonight’s full moon. Thanks, Ginny. Such deep listening also helps me.